This chapter tells the story of office-to-residential change of use in Camden. As with all the English case studies (Chapters 6– 10), we start by outlining the context of this authority in terms of its location, built environment, socio-economic trends and planning documents and approaches. Interviews with a range of local stakeholders to gather their views on office-to-residential permitted development are summarised. Case study buildings are overviewed, explaining the history of these buildings and their conversions. The overall impact on Camden and its communities of this permitted development is suggested. 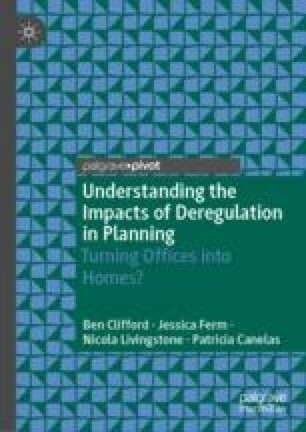 The chapter discusses the particular issues seen in Camden, particularly the loss of employment space and the conversion of occupied offices. Camden Council. (2015a). Article 4 for Office to Residential Conversions (outside the CAZ). https://www.camden.gov.uk/theme/fc-sw2/ccm/content/environment/planning-and-built-environment/two/planning-applications/before-you-apply/article-4-directions/. Accessed 2 September 2018. Camden Council. (2015c). Planning Obligations: Camden Planning Guidance [CP8]. https://www.camden.gov.uk/ccm/cms-service/stream/asset?asset_id=3606661&. Accessed 2 September 2018. Camden Council. (2017). Camden Local Plan. http://camden.gov.uk/ccm/navigation/environment/planning-and-built-environment/planning-policy/local-development-framework/. Accessed 2 September 2018. Camden Council. (2018). Find a Planning Application. https://contact.camden.gov.uk/planning-search/. Accessed 2 September 2018. Hayes, D. (2018). A History of Camden Town 1895–1914. https://www.tate.org.uk/art/research-publications/camden-town-group/david-hayes-a-history-of-camden-town-1895-1914-r1104374. Accessed 2 September 2018. URS. (2014). Camden Employment Land Study: Prepared for the London Borough of Camden. https://www.camden.gov.uk/ccm/cms-service/stream/asset/?asset_id=3245317. Accessed 2 September 2018.